Dr Christopher Wiley has contributed expert comment to an article that appeared earlier today (28 June 2012) in the BBC News Magazine. 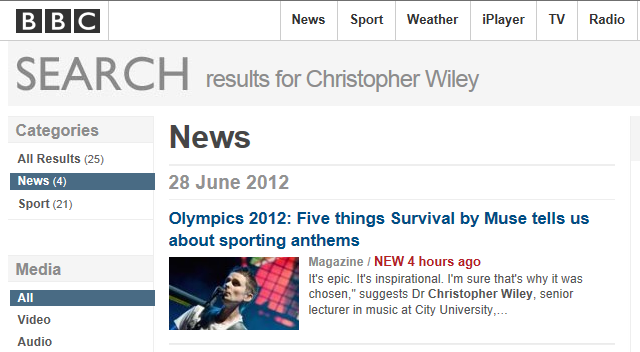 Speaking about ‘Survival’ by British band Muse, which was recently unveiled as the official song of the 2012 London Olympic Games, Dr Wiley is quoted as saying that ‘It’s epic. It’s inspirational. I’m sure that’s why it was chosen’. The article, written by journalist Jon Kelly, also quotes Dr Wiley as saying that ‘There are sections that sound like a marathon and others that sound like the 100m’, alluding to the song’s varied and multi-sectional nature. The full article may be accessed here: http://www.bbc.co.uk/news/magazine-18624954.